How can I get better cellphone reception in my home without a mast? Femtocells are currently offered as a solution in dozens of countries, improving coverage by filling in the gaps and eliminating loss of signal through buildings. Capacity is improved by a reduction in the number of phones attempting to use the main network cells and by the off-load of traffic through the user’s network (via the internet) to the operator’s infrastructure. Instead of using the operator’s private network (microwave links, etc. ), the internet is used. Once plugged in, a femtocell connects to the cellphone operator’s network via broadband (incl FTTH) to provide extra voice coverage over a range of typically 10 metres each. Because it is extremely localised there is less impact further away and because it is plug and play there is no specific installation or technical knowledge required to install a femtocell at home. Although we don’t recommend this solution from a health perspective, it gives users who aren’t concerned about the impact of niEMR on their health more choice in their own working and living environments. And it’s preferable to blanketing the surrounding neighbourhood environment with ever-increasing amounts of wireless radiation. These have value in rural settings as well. 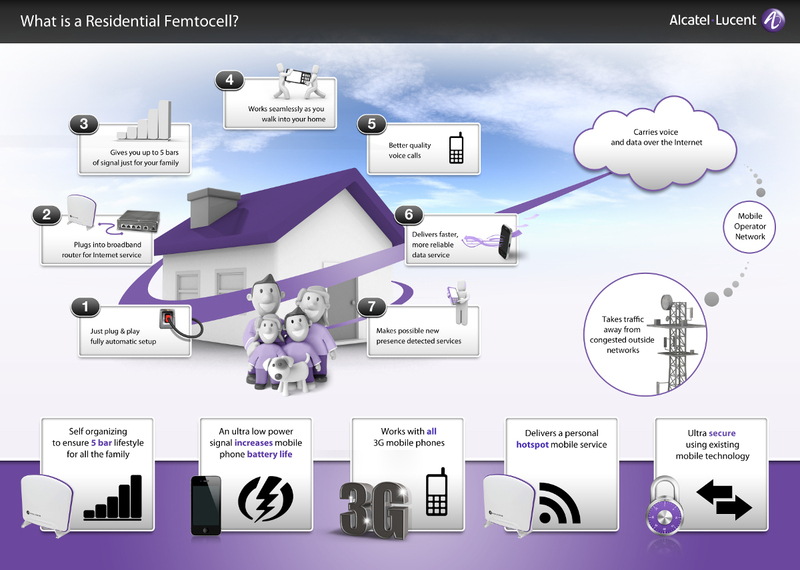 Operators that have launched femtocell service to date (2016) include Vodafone, SFR, AT&T, Sprint Nextel, Verizon, Zain, Mobile TeleSystems and Orange.